Situated in the popular village of North Pickenham, Longsons are delighted to bring to the market this spacious, very well presented four bedroom detached house with garage. 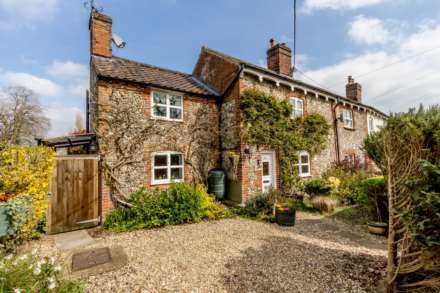 This superb property offers many benefits including multi fuel burning stove, glorious countryside views to the rear, delightful generous gardens, two reception rooms, four double bedrooms, utility room, air conditioning to two bedrooms and UPVC double glazing. 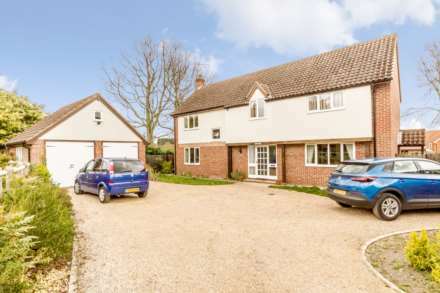 Situated approximately 3 miles from the market town of Swaffham, 20 miles from Kings Lynn and 25 miles from Norwich. The nearest rail station is Downham Market or Kings Lynn and there is a bus service with buses running 3 times a day. The village amenities include primary school, The Blue Lion Pub and a church. Composite double glazed entrance door to front, obscure glass UPVC double glazed window to front, stairs to first floor, wooden parquet flooring, radiator. Feature fireplace with wooden surround, tiled hearth and inset multi fuel burner, UPVC double glazed patio doors opening to rear garden, UPVC double glazed window to front, two radiators, wooden parquet flooring. Double aspect glazing with UPVC double glazed windows to front and side, wooden parquet flooring, radiator. Fitted kitchen units to wall and floor, work surface over, one and half bowl composite sink unit with mixer tap and drainer, integral Bosch double electric oven, integral Bosch induction hob with extractor hood over, space and plumbing for dishwasher, breakfast bar, space for fridge freezer, recessed alcove with oil fired central heating boiler, tiled splashback, UPVC double glazed window looking out to rear garden, radiator, door to utility room. Fitted kitchen units to wall and floor, work surface over, space and plumbing for washing machine, UPVC double glazed entrance door opening to rear garden, UPVC double glazed window to side. Wash basin, WC, tiled splashback, obscure glass UPVC double glazed window to side, radiator. Built in cupboard housing hot water cylinder, loft access, UPVC double glazed window to front, radiator. Fitted wardrobes, UPVC double glazed window to front, radiator. Wall mounted air conditioning unit, wash basin, UPVC double glazed window to rear, radiator. Wall mounted air conditioning unit, wash basin, free standing wardrobes, UPVC double glazed window to rear, radiator. Bath with mixer tap and hand shower attachments, wash basin, WC, heated towel rail, extractor fan, UPVC obscure glass double glazed window to rear. Single garage, up and over main door to front, UPVC double glazed window to side, access door to side, electric lights and power. Well maintained front garden laid to lawn, selection of shrubs, plants and ornamental trees to beds and borders, shingle driveway, hedge to perimeter, gated access to rear garden. Delightful generous enclosed rear garden laid to lawn, patio seating area, driveway to garage door, selection of shrubs and plants to beds and borders, lovely views to rear, wooden fence to perimeter, gated access to front. The land adjacent is currently for sale with planning permission for the development of eight properties. This development will not impede upon the open outlook to the rear of this property. For further details, please contact our office.